In the side navigation click on the form name or go to Manage All and click Edit by the form you want to update. Edit the form details as desired using the options and tools provided. 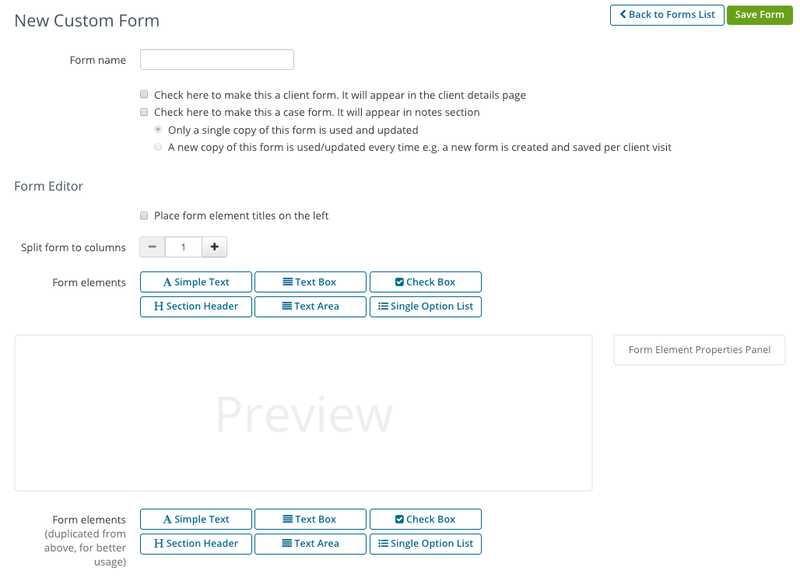 Enter the desired Form Name, Column Count (up to 2 columns), and how you want the form appear in the client pages. Note: Preview is visible below the editing tools as you are making changes to the custom form. 5. If the form you are editing has been in use and you edit existing fields, your information could be removed. For example, if you have a field in the custom form called First Name, and the field First Name has been used in a client's file then you will receive a notification when you attempt to Save the form. The notification will show the fields that are being edited and have information stored in them. You will need to check the box I understand that some saved data will look inconsistently or will be lost and click Confirm the Update to Save the new custom form.